General. 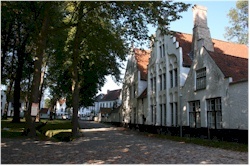 The béguinage of Bruges (Begijnhof Ten Wijngaarde) is one of Bruges' most well-known landmarks. It consists of a collection of white-painted houses, a chapel and buildings for general utility purposes and religious purposes. Most of the houses are gathered around a central square that is planted with trees. There are two entry gates to the béguinage: the so-called "Cow gate" (Koepoort) near the Minnewater and the main entrance near the Wijngaardsquare. The entry gate bears the year 1776, referring to the date the gate was built. The entire site has been thoroughly restored and is a protected monument. Together with the béguinages in other Flemish towns, it is inscribed in the Unesco heritage list. It also hosts a museum. TIP: the site is particularly beautiful in spring when daffodils are sticking their heads above the grass in the central square. Brief history. 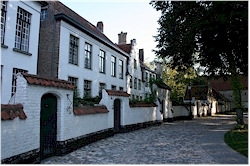 This béguinage was founded in 1244 by Margaretha of Constantinopel and was then located outside the town walls of Bruges. In 1299 it received the title "princely béguinage" when it came under the authority of the French king Philip the Fair. Also at the end of the 13th century when the second town walls were built, the béguinage was incorporated within the town walls. The original church burnt down at the end of the 16th century and was rebuilt at the beginning of the 17th century. Its present shape largely dates back to that period. The entire complex has been reshaped during the centuries with the oldest houses dating back to the 16th century. There are no longer béguines living here but there still is monastery life since Benedictine nuns opened a convent on the premises in 1927.